Congressman Ron Paul talks to TheStreet's Alix Steel on how a return to the gold standard could fix the U.S. debt crisis. WASHINGTON (TheStreet ) -- Congressman Ron Paul fears gold prices could hit $10,000 an ounce if the U.S. doesn't get its fiscal house in order. Paul, a Texas Republican, has been in Congress for 35 years, has had two unsuccessful runs for the Republican nomination for president and is now embarking on a third attempt. Paul's message has been consistent, abolish the Federal Reserve, stop printing money and go back on a gold standard. But only now, with the U.S. butting up against the debt ceiling having already racked up a $14.3 trillion deficit, are people starting to pay attention. After a recent Republican debate, Paul had 11% of potential voters as the slogan "End the Fed," also the title of one of his recent books, catches on. 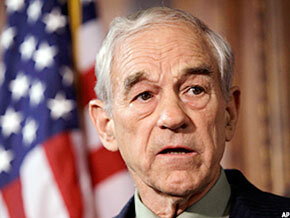 I interviewed Paul on Capitol Hill to find out how the gold standard would fix the U.S. fiscal crisis. The Street: I know you love the gold standard, but my question is how do you make that ideal a reality in a modern day society? Paul: Well it's not so much that I will make it a reality or any one person will do it, it will become a reality when the current system fails and it's in the process of failing. The first process is for the financial bubble to burst, which it has, and then the response being massive monetary inflation, which will destroy the value of money, which we have done insidiously ever since we have had the Fed. At one time the ratio of dollars to gold was $20 to 1 ounce, now it's over $1,500. They'll lose control, people will panic out of the dollar, then you'll see gold at maybe $5,000 to $10,000, and then they'll say we have to do something and then that's when countries resort to something of real value to regain the trust. But now we're losing the trust and we're only waiting on that day, so when that happens there will be a restoration of sound money to some degree. So with gold at $5,000-$10,000 does that mean the dollar is at zero or 10 compared to other currencies? I think we're going to come to our senses before that, but in other countries they have. You know Germany, Zimbabwe, Mexico they've had to start all over again. I'm hoping that we come to our senses and we just say all right, we're going to quit spending, quit printing money and then restore confidence, but it's up for grabs because the bubble is bigger than ever before and the world is enduring a dollar standard. Especially since 1971, all the currencies are linked; they use the dollar as a reserve, so it's not just us that has to deal with this. Right now, as a matter of fact, we're benefiting to a degree from that because the other currencies have used the dollars as if they were gold, and they're in trouble, say a country like Greece and others, they inflated on top of ours so they even resorted to using dollars, so that gives us a temporary reprieve. Exactly how do we deal with that? How do we implement that? I know you have talked about gold certificates, but how do we do that worldwide and in our own country then? Well we can't deal worldwide. The opposition, those who believe in government, are trying to do that worldwide probably not use gold but probably use fiat money, you know at the IMF, which I would find very annoying. But we can only deal with our own problems. They followed us when we had a sound dollar, and then they followed us when we made our dollar unsound, but if we can lead the way we could just say we would stop printing money. How do we go back to some kind of gold standard? I know that one of the myths that you debunked back in the '80s was that there was not enough gold. Maybe back in the'80s there was enough gold, but there is definitely not enough gold right now. The argument is the same. The other day I picked up a good silver dime, and I got to thinking that is one tenth of an ounce. That's worth about $4. I could still buy two loaves of bread with it. Or one gallon of gas at this point. Paul: So all of a sudden you have a lot of money, when it's sound money, but we have a precedent to follow but it's not as easy as it was. We were off the gold standard from 1861 to 1878, and they had a resumption act, and what they did was they promised no more greenbacks; we're not going to run any more deficits; we're not fighting any wars; we don't have a welfare state and people believed them so gold went from like $150 an ounce down to $20 an ounce. It was a nonevent; they went back to the gold standard. So you think that all it would take would be for the government to actually say that? No, nobody would believe them, but they have to do it. That's why it's tough, and this is also the reason that I'm opting out for not waiting for that day. I want competition with the Fed. I want to legalize the Constitution. I want to legalize the trading in gold and silver, no taxes, no sales taxes, no capital gains taxes. Private companies can mint their own coins, they just have to be not fraudulent, like our government is fraudulent. They don't back their currency with anything, but you would have to repeal the legal tender laws, and if the crisis doesn't come, then people ... can just go with the Federal Reserve, trust the Fed forever. But if a young person thinks they have to put away money for their future or raising their kids, they might think, "hmm, maybe I oughta buy a gold bond" because if you put $10,000 away today to educate somebody in 10 years, you'll get your $10,000 back, but school might cost you 20k, so nobody is going to save in dollars, but they would save in a gold bond. So is this something that we would see -- dollars in circulation and also gold and silver coins in circulation, and then the people are free to chose which they would rather do business in? Is that your hope that eventually more people would choose gold and silver that would take us out of this fiat currency? Paul: Yeah, and I think they would. You're leaving a lot of faith in the people, though? Better than having faith in the government or the Fed, you can't trust them. But the Mexican government is doing this now. They have savings accounts in silver, but we do it internationally all the time not with gold but the various currencies, the banks, the corporations and international trade. Every single second of the day they are varying the exchange rate between dollars and yen and euros and Swiss francs so in this computer age it's not a problem. You actually literally could do it if you wanted to buy something with a gold coin or silver coin there could be an adjustment. So the idea isn't that every dollar in circulation is then backed by a certain coin that is somewhere in Fort Knox, for example ? Not in a transition period. Later on it doesn't have to be the government. I actually believe in the free market thinking: the private companies could do it, but if you try to mimic what we had before, yes, reserves would have to be held in gold and that would limit -- see that's why they don't want it -- see conservatives and liberals don't like it because that would limit spending. Today they can spend endlessly and the debt can be bought by the Fed out of money created out of thin air. That is the key to the problem. But even if we had half the amount of debt we have now, there literally isn't enough gold in the world. So we would have to have the gold price rise to $5,000 or sop $9 trillion out of the system . That's probably what would happen. What would that do to people? I mean that feels like that would be such a deep depression. No, you have the depression when you have runaway inflation, and that's when you get money that doesn't buy anything. They're working on trying to get rid of the debt by more rapid depreciation of the currency, so if you can get that currency say 50% more depreciated here in the next couple of years, the debt would only be $7 trillion. That's what they're working on, that's what the problems is, that's when people get cheated and the people who pay for that are the average people who have to pay higher prices in the stores and they are already feeling this. They are getting the brunt of this much, much worse than having a limitation on the printing of money. All we're saying is you can't commit fraud. If you did it, you'd be a counterfeiter, but if we participate here in Washington and let the Fed counterfeit the money to subsidize our wars and our welfare, we're considered good politicians, but that's coming to an end. I just don't really see how a gold-backed dollar really makes sense in this day and age, especially when other countries aren't doing it? Well, they would follow us most likely, but what you have to compare it to is how does printing money make any sense? That makes zero sense. Money has to originate in the market; it originates as an advancement of pure barter. Bartering started, and then you had to have the money developed because it was easier to have a third exchange instead of corn for cows or something like that; you priced it in an ounce of gold, that enhanced trade. Then when you had the money with no definitions, it's like building a building with a yard stick that is changing its measurements every single day. You can't do it; that's why you can't do an economy on a fiat currency that varies its value every day, and of course the Fed rigging interest rates is a major problem too, so you want to free that up and have the market send the signals, not the Fed. It just seems that were too far gone now. We can make changes, we can make adjustments, we can offer another legal tender in the country, but it just seems like we are just too far gone to go back to where we were 200 years ago. A lot of people think that, but the alternative is so bad that we do have to make the effort. But history has shown that fiat currencies internally self-destruct, and they always go back to gold. Gold, if you pick up a coin minted 6,000 years ago, you'd still have your money. If you pick up a piece of paper printed a year ago, it might be worth half its value. So history is on my side of the argument. What if we go to war? I know you are against foreign involvement in Iraq right now, but what if we do go to war? What if we have a natural disaster, and we need extra cash. What do we do if we are on a gold standard? The cash has no value; it's just diluting the current value. It steals from people, and eventually what happens when you have the inflation you need ... people will always say we're short cash. The more you print, the less value you have. You can't get value. You can't create wealth out of printing presses. It doesn't seem though that that would help Japan if they were on gold standard how would they have rebuilt after their earthquake, what would they have done if they were on a gold standard ? Well, they did it before. We were on a gold standard in the year 1900. Galveston had the worst hurricane in the history of this country. We didn't have FEMA, we had the gold standard, no federal government bailout and we rebuilt the city of Galveston. By now they are having a terrible time with FEMA. FEMA is $18 billion in debt. It doesn't work to believe you can get wealth by just getting pieces of paper. Now I know people speculate in currencies and obviously gold and silver as we saw in May when we had the big crash for silver and gold as well. With the advent of ETP and ETF products, does that worry you in terms of speculators being able to manipulate a legal tender? Well if the people do, if they cheat and they are committing fraud they should go to jail. So there should be regulation preventing them from trading and speculating in gold and silver? No, just a law against fraud. You don't need all these regulations; they cause a lot of problems. But the people who are defrauding the people right now ought to go to prison too because of what they're doing to the money. They are stealing and robbing from the people, and people work hard and they earn a dollar, and the next day it's worth 90 cents. Somebody should be accountable in a moral way, but no, that's called good politics. So does that mean that traders at the Nymex should go to jail for speculating on gold and silver? No, no speculators are doing a good job trying to sort out the real value, but if you manipulate and defraud, that is different. If it's an ETF, and they bid it up, and they didn't put any money into gold or silver, that's fraud. But if it's legitimate, people are betting that the dollar value is going down; they're not so much betting on the price as they are on the value of the dollar going down. They provide a good market function.